T/O Newmarket 1712 - target Berlin, Germany. Crashed at Kruisberg Dune near Heemskerk, Netherlands. Cause of crash possible engine failure on its first operational flight with only 4 hours flying time recorded. (Exploded in mid air). Equipment: IFF, GEE, MONICA. Bomb Load: 1 x 4000lbs, 6 x SBC 4lbs incendiaries, 4 x SBC 30lbs incendairies. Route: SOUTHWOLD - 5250N 0330E - 5235N 0440E - 5238N 1005E - 5238N 1220E - BERLIN - 5243N 1400E - 5525N 0938E - 5523N 0825E - 5510N 0700E - CROMER - BASE. 483 Lancasters and 10 Mosquitos on the main raid to Berlin and 5 further Mosquitos dropped decoy fighter flares south of Berlin. The bomber route again led directly to Berlin across Holland and Northern Germany and there were no major diversions. The German controllers plotted the course of the bombers with great accuracy; many German fighters were met at the coast of Holland and further fighters were guided on to the bomber stream throughout the approach to the target. More fighters were waiting at the target and there were many combats. The bombers shook off the opposition on the return flight by taking a northerly route over Denmark. Berlin was cloud-covered but the Pathfinder skymarking was reasonably accurate and much of the bombing fell in the city. In the city centre, the National Theatre and the building housing Germany's military and political archives were both destroyed. The damage to the Berlin railway system and to rolling stock, and the large numbers of people still leaving the city, were having a cumulative effect upon the transportation of supplies to the Russian Front; 1,000 wagon-loads of war material were held up for 6 days. The sustained bombing had now made more than a quarter of Berlin's total living accommodation unusable. 25 Lancasters, 5.2 per cent of the Lancaster force, were lost. Many further aircraft were lost on returning to England. On their return to England, many of the bombers encountered very low cloud at their bases. The squadrons of 1, 6 and No 8 Groups were particularly badly affected. 29 Lancasters (and a Stirling from the minelaying operation) either crashed or were abandoned when their crews parachuted. The group with heaviest losses was No 1 Group with 13 aircraft lost; the squadron with heaviest losses was 97 Squadron, No 8 Group, with 7 aircraft lost. Age: 23 - °4 May 1920 - Also served in the Wellington Regt. Son of Thomas Henry Newton and of Lily Rose Reading, of Wellington City, New Zealand. Heemskerk Protestant Churchyard - Plot 1. Grave 308. Son of Mr. and Mrs. G. D. Seatter, of Oulton, Norfolk. 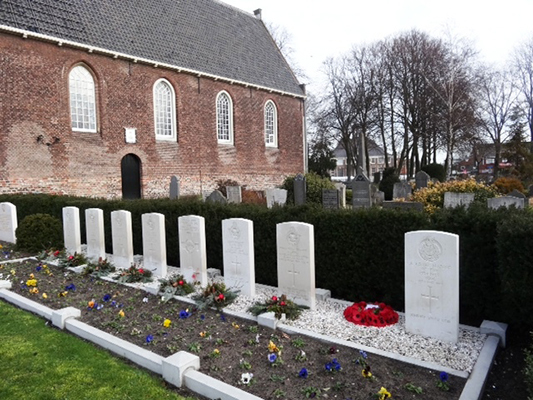 Heemskerk Protestant Churchyard - Row 1. Grave 304. Source: CWGC - photo via www.tracesofwar.com, Paul Moerenhout. Son of Francis Richard and Amy Eliza Downs, of Bristol. Heemskerk Protestant Churchyard - Plot 1. Grave 307. Son of Frank Weedon Ray and Ada Elizabeth Ray, of St. Albans, Hertfordshire. Heemskerk Protestant Churchyard - Plot 1. Grave 309. 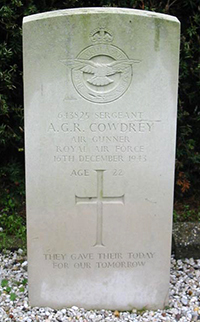 Son of Alfred William and Ellen Cowdrey, of Eastney, Portsmouth. Heemskerk Protestant Churchyard - Plot 1. Grave 305. Son of Walter and Elizabeth Hawkins. 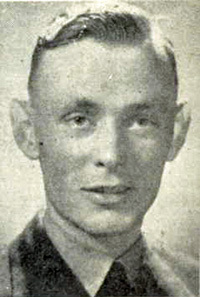 Husband of Beryl Joyce Hawkins. Heemskerk Protestant Churchyard - Plot 1. Grave 306.